Jun 13, 2014 — by Daniel Whiteman D.M.D. The root canal refers to the central chamber of the tooth, which houses the nerve and pulp. This area of the tooth is protected by the surrounding dentin and enamel. However, if tooth decay, or a cavity, penetrates these protective layers of the tooth, bacteria are able to infect the soft tissue of the root canal. If left untreated for a period of time, the root canal infection can produce a range of symptoms. Eventually, the infection could destroy the tooth, leading to the need for extraction. In this blog post, Brookline dentist Daniel Whiteman describes the signs that are associated with root canal infections. If you have developed any of these symptoms, schedule an appointment with your dentist as soon as possible so the health of your teeth and gums can be evaluated. A root canal infection can result in pain whenever pressure is applied to the tooth. This could occur when chewing food or grinding the teeth. Since we use our teeth daily to chew our food, pain that is caused by pressure can result in real functional problems for the patient. These patients may avoid hard or crunchy foods and even change their diet to soft foods that don’t cause any pain and require less chewing. Another type of discomfort that could occur as the result of a root canal infection is sensitivity to hot and cold. This could be a reaction to hot or cold foods and beverages, or even when breathing in cold air. When this type of sensitivity occurs, patients may avoid foods and drinks that are extreme temperatures. Another possible sign of a root canal infection is tooth discoloration. The tooth that is affected may appear darker than usual. As the pulp within the root canal chamber degenerates, it may give the tooth a darkened appearance. Patients with a root canal infection may experience pain or inflammation of the surrounding gum tissue as the infection spreads. The bacteria that are degrading the tooth structure are now eating away at the gum tissue, exacerbating the symptoms and damage caused by the root canal infection. As the infection spreads, pus-filled pimples or abscesses may form on the gums. This is a sign that the infection has spread all the way down to the roots of the tooth. Patients who experience any of these symptoms should schedule an appointment with their dentist immediately. 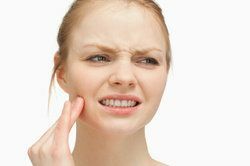 Though some of these symptoms could be signs of another dental problem, such as tooth erosion or a minor cavity, it is important to treat these smaller problems before they develop into bigger issues. If the patient has developed a root canal infection, the dentist may still be able to save the tooth with endodontic therapy, or a root canal procedure. It is also important to note that some patients will not experience any symptoms as a result of a root canal infection. That is why it is so important for patients to see the dentist every six months, so potential problems can be identified with an exam and X-rays. To schedule a dental appointment, contact Whiteman Dental Associates.